This beautiful gift book contains over 140 brief selections from four of Father Keating's most popular works, including the best selling Open Mind, Open Heart. An application of this book is using it as a 'minute book,' a recommendation of Father Keating's. He suggests one carry in pocket or purse a 'series of short readings-a sentence or two, or at most a short paragraph-from your favourite spiritual writers or from your own journal that reminds you of your commitment to Christ and to contemplative prayer.' In the midst of a busy day, when one finds a 'stray minute or two,' Father Keating recommends reading a few lines and reflecting. This book constitutes a splendid minute book for those for whom Father Keating's writings are both inspiration and guide. Keep it by your bedside, tuck it into a shopping bag or briefcase. This beautiful gift book contains over 200 selections from the wisdom of several of Father Keating's most popular and significant works, including the best selling 'Open Mind, Open Heart'. 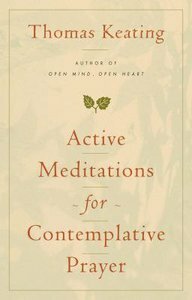 About "Active Meditations For Contemplative Prayer"
1. Contemplation, Contemplative Prayer; 2. Centering Prayer; 3. Thoughts; 4. The Human Condition; 5. Crisis; 6. Faith; 7. Transforming Union, Divine Energy; 8. Interior Silence; 9. Service; 10. From The Gospel: Scriptural Foundation.